… tool for all couponers, from the occasional user to the accomplished extreme couponing master. 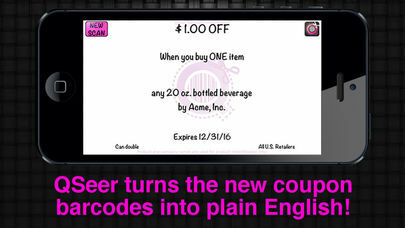 The new barcodes on coupons convert all of the important terms into a machine-readable code. The problem for couponers is that these codes are usually different from what is written in English! Until QSeer, couponers were at the mercy of the codes, as you had no way of knowing what the barcodes actually said. Manufacturers designed this system deliberately so humans would not be able to interpret the codes. 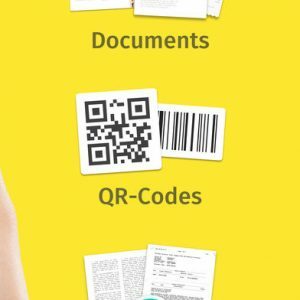 QSeer unleashes the power of the iPhone to give you the ability to see what information is hidden in these barcodes and how to use those details to minimize your grocery bill. 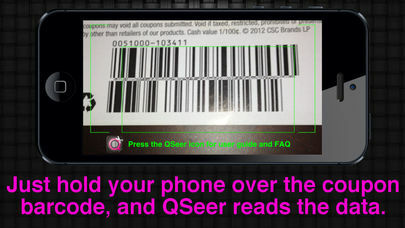 QSeer not only reads the new barcodes, it converts them into plain English that you can use to plan your shopping. QSeer helps you match a coupon to the right product size and variety, eliminating those nasty check-out surprises. And it couldn’t be easier to use, as it works automatically with the touch of a single button!
? 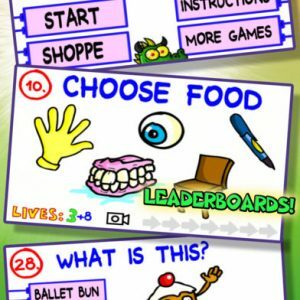 An incredibly easy-to-use app. Press one button, and then hold your iPhone over the coupon barcodes. QSeer does all the rest automatically! While your download does include a professional tutorial, you really will not need it. But if there’s anything that is not clear to you, help is one click away.
? Knowing whether your coupons can double or triple (at stores that offer this program). QSeer flashes an alert if a coupon contains a hidden code that suppresses the multiplying bonus!
? Identifying whether a coupon is restricted to particular stores or if it can be redeemed anywhere.
? 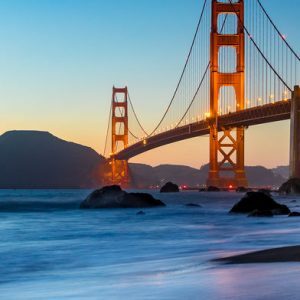 Understanding the true purchase requirements. Using proprietary QSeer databases, QSeer is able to match over 98% of coupons to actual store products, so you can plan your shopping with confidence.
? Alerting you to errors in the barcode that can cause problems at checkout. The new barcodes are so complicated that more than half have some sort of error. 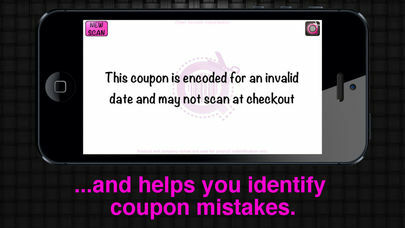 QSeer alerts you to the errors that are likely to prevent a coupon from scanning properly.
? Recognizing data privacy concerns. The new coupon codes allow manufacturers to track when you use your coupons and exactly what you buy. They can hide a customer number, an IP address, or even your Social Security number in the barcodes. QSeer will alert you when a coupon contains one of these tracking codes. Note that QSeer does not ask you for any personal info – we only alert you when it is there!
? Working anywhere with no data usage. QSeer will not run up your data usage, because it doesn’t need Internet access to operate. It will even automatically activate your iPhone’s flash to work in the dark! QSeer was built by a team that includes two extreme couponers, a pair of Mathematical geniuses, and a marketing expert who formerly designed coupons for Kraft Foods. QSeer is designed for the needs of couponers by people who truly are experts with coupons. QSeer is a coupon barcode interpreter. QSeer only reveals the information that is encoded on a coupon without any moral judgment or redemption suggestions. QSeer is not designed to be used as a vehicle for the misredemption of any coupons. QSeer Users are advised to read our End User Licensing Agreement (EULA) for further details.